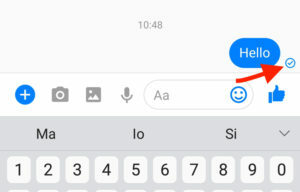 This article is designed to explain the mysterious icons that appear on Facebook Messenger when you send and receive messages. Much like the ticks from WhatsApp conversations, you need to know more about the icons and symbols that appear on messages you send through Facebook Messenger. Many of the icons that you see are relative to the status of the message that you are sending. 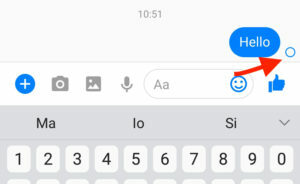 These can be seen at the bottom right corner of the message speech bubble. When you see this blue outline of a circle, it is an indication that your message is being sent. When you see this icon, the Facebook servers have yet to receive the message, so it has not been delivered to the intended recipient yet. When you see the same blue circle, but this time with a check mark, your message has received Facebook servers. To put it plainly, it means that the message has successfully been sent from you to where its going, it just hasn’t made it to where it is supposed to go yet. If your recipient is not connected to the internet, your message may stay in this limbo until the message gets officially sent to the intended party. ☝ Note: You might have this message stay with this icon even if the recipient is connected to the internet if they are not in your friends list. It will reach their profile and be in a “message requests” queue until they open it there. This icon is to tell you that your message has been successfully transmitted to the appropriate recipient. It also means that the intended party has not read the message as long as you see the icon this way. They have not opened or read your message. ☝ Note: A recipient that is not in your friends list might continue to give you this icon (or the previous one) because their message is in the earlier named queue waiting for them to read it. 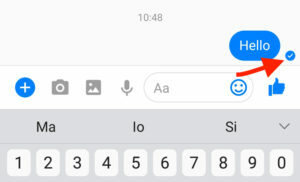 Friends might also have this icon last even when you are sure they saw the message, because their phone allowed them to read it from their notifications on the phone rather than to open the Facebook app and alert you the message was read. When you see the avatar icon, you can be assured that the recipient has seen or read your message you sent. You will see that for a moment, your screen might indicate that the recipient is “Active Now” even if they have turned chat off. This icon (as it is also explained with the text beside it) indicates a failure to send the message from your end. The best solution is ensuring you are connected to the internet and attempt to send the message again. Do not navigate away from the chat until you see the “sent icon”. How Do I Know My Message Was Read? The simplest way is to check for the avatar icon by the message that you sent to see if it is there. This will tell you the message has been seen and read. However, if your recipient read it from the notification bar of their phone, there is no telling if it was seen or not without spying on their mobile device. Is There A Difference Between Sent and Delivered? Yes, there is a very clear difference between the two. “Sent” messages are ready to get delivered to the recipient, but the party is not connected to a network to receive the message you are sending. “Delivered” messages are received by the intended party, but they have not been read yet. Can I Delete (Or Unsend) A Message Once I’ve Sent It? Unfortunately no, once you have sent a message it is out there and in the process of being delivered to the intended party. It will arrive in their message inbox when they are connected to the internet, and could possibly even go to their email depending on their notification settings. If you have any questions or concerns about the Facebook symbols you see or making sense of what icon is around the message you are sending, feel free to drop a comment below so I can help.